I met the very friendly and eloquent Mario Saraceni at the conference and was keen to hear his point of view on the Future of ELF in this plenary-like early evening session of the day. ‘The Future of ELF: The Linguistic, Ideological and Pedagogical Relocation of English’. 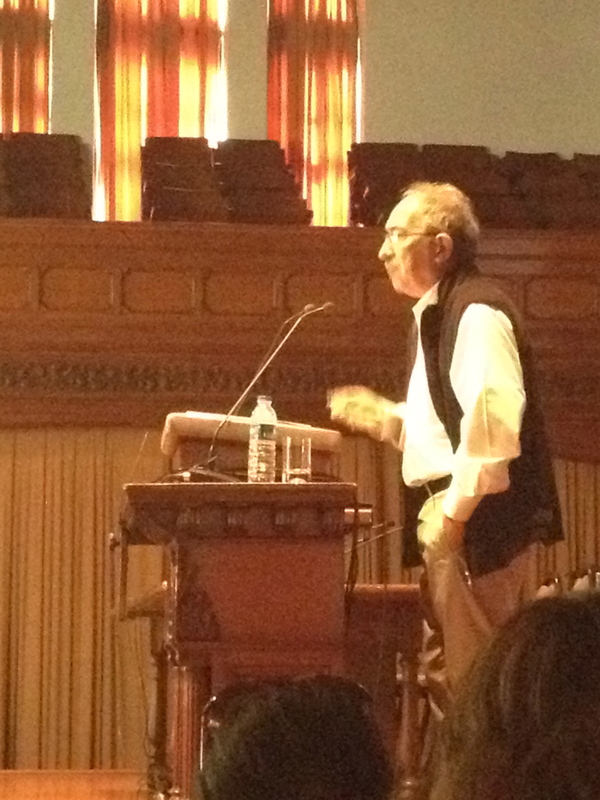 Mario humbly introduced himself and joked that he had taken the title of the ‘Future of ELF’ symposium very literally. 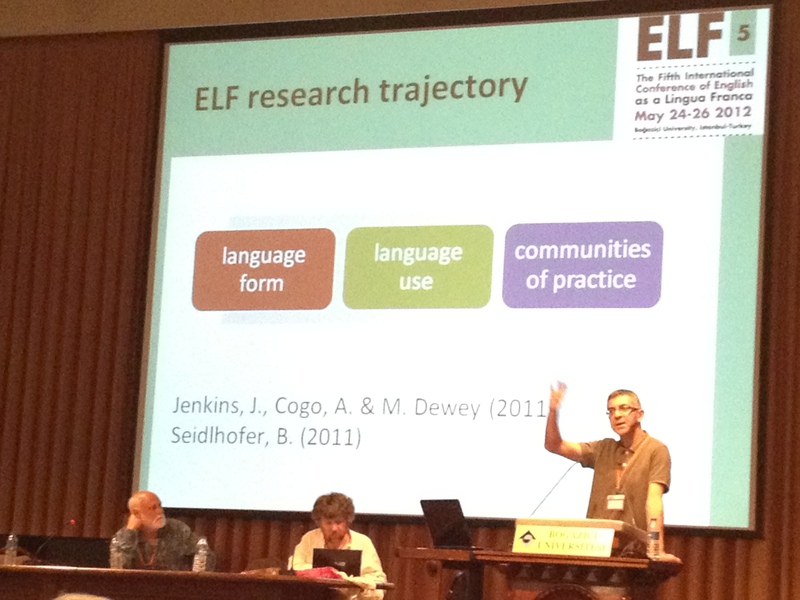 Stating that ELF as a research area has moved from focus on language form towards language use and communities of practice, Mario starts by looking at early ELF research, and the shifts it has seen. Risk of replicating the same ‘spot the difference’ approach adopted in some World Englishes research – ELF inevitably judged against NS models and so the common features end up being the common deviation from NS English. The shift of focus towards the pragmatics of ELF and eventually towards the notion of communicative practice marks an importanat development in ELF research. One fundamental implication is that ELF ceases to be a linguistic entity and the term acquires a more complex, subtle and itnersting meaning – it refers both to a research are (the new ELF journal is a concrete product of that), and to a particular orientation towards the study of English and ultimately of language in general. Lingua Franca or lingua frankensteinia? ELT ‘Anglo’ culture; NS vs NNS speakers – which model? What is the role of the NS? One fundamental contribution that ELF research has made is an invitation to understand the ‘thing’ English in different ways. So English is no longer exclusively the language of the English and becomes deanglicized. ‘dialah di hat….siti 4ever…I really like this song… try 2 sing this song unfortunately sore x sampai… =,’ etc. This is the norm in the age of Web 2.0 and not an exception. Making the point that this linguistic matter does not necessarily need to be given a name, the mixing and evolution of language is a sociolinguistic reality and a way of communication. Using more examples from the Bangkok post of the lexis ‘minor wife’ and ‘soi’ (meaning ‘street’) and ‘make merit’ (most teachers commented they would correct this ‘mistake’), Mario says we shouldn’t have to look at language in boxes. The notion of ‘a language’ makes little sense in most traditional societies. And most people wouldn’t even consciously realize they are using ‘Language’. The focus on the language user in ELF research is a useful direction in that a systematicitv investigation of the representations of English may help us establish whether observed language behaviour that we researchers see as deanglicization of English is such in people’s mindsets too. In a short Q&A session after, Jennifer Jenkins asks him ‘Why not correct ‘make merit’ for if we expect international intelligibility from NSs, we should expect it of NNSs too.’ After all, we can’t negotiate meaning in a written text (remember that this was published in the Bangkok post). Would you correct a student who writes ‘make merit’ in their essay? I came to this session partly because I had read papers by the speaker Jagdish Kaur for my dissertation and found them relevant and interesting, and was curious to see her in person, and to hear more. What surprised me was the fact that she was the same person that was seated beside me during the opening plenary, and suddenly I felt rude for not having said hello. 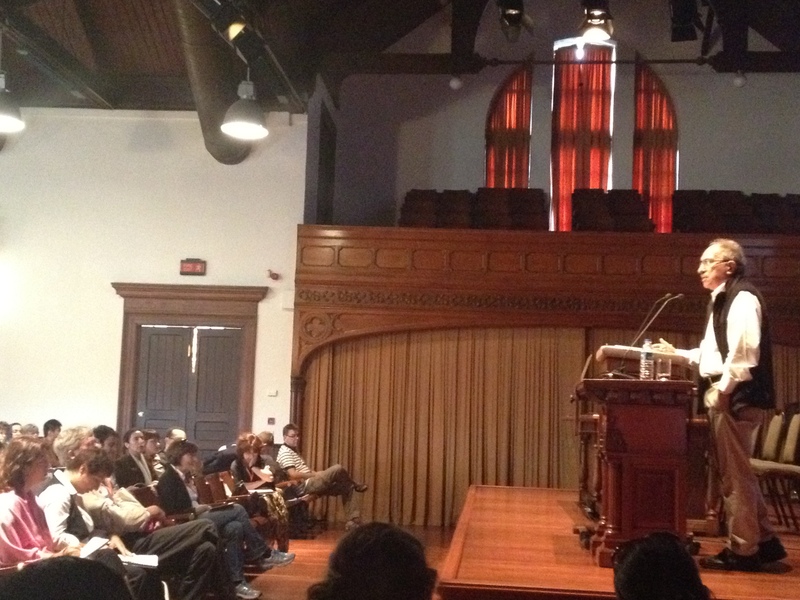 Here is her very interesting and well-presented talk. Taylor calls competence a controversial and confusing term (1988), Widdowson says it’s a fussy concept (1989). Is it just knowledge (as in Chomsky)? Or is it about the ability to use knowledge? Does not merely expand the conception of competence but rather changes it as his notion of communicative competence conveys something quite different from what Chomsky intended. Researchers concerned with the competence of the L2 speaker have reconceptualised the idea further to suit the context. Cook talks about multiple competencies. Kim (1991) introduces intercultural communicative competence = an additional level of metacompetence involving explicit awareness of differential usages and ability to adapt communicative strategies to a variety of cultural situations. Researchers working with post-structuralist ideas and sociocultural perspectives in language learning and use view competences as resulting from actual use of the language, rather than the contrary. It is by doing through engagement with others that competence is co-created in interaction. 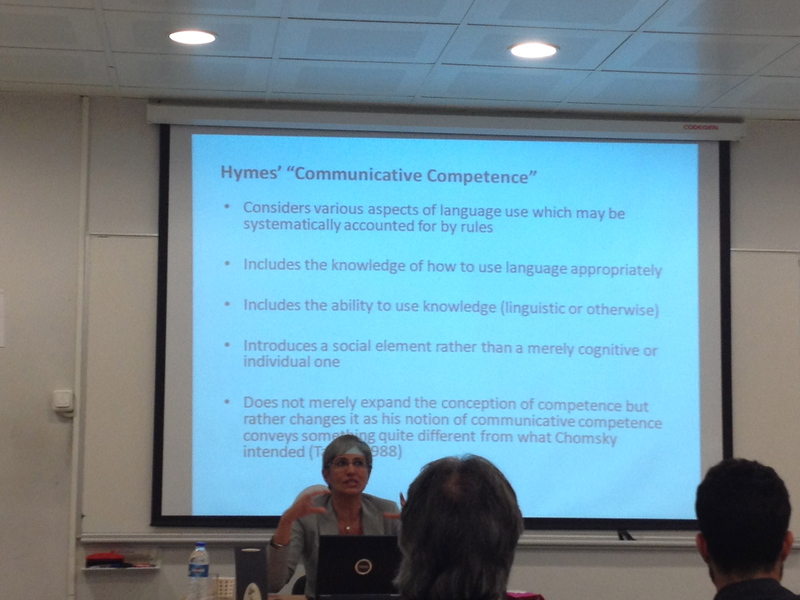 Competences as socially constructed and the L2 Speakers’ competence as active and dynamic rather than static. Empirical research into ELF points to a form of intercultural communication that is both effective and efficient. Repeating a repaired segment of talk addresses any impairment to the clarity of the utterance caused by the repair move itself. Widdowson (1989) in his conception of ‘communicative competence’ talks of ‘adjustments’ and ‘adaptations’ made to suit the contextual demands of the communicative situation. The extracts reflect the speaker’s awareness of the precarious nature of the communicative situation and the need for greater communicative clarity. Speakers display a ‘lingua franca communicative competence – cognizance of the diversity inherent in the lingua franca situation and the accompanying skills to manage this diversity actively and efficiently. Cem Alptekin starts his talk ‘A Usage-Based Approach to ELF identity’, showing two different pictures of elves, showing how even within elves, there are different types and varieties. In an article published by Guardian by Julianne House, she describes ELF as ‘a stateless language that Europe must embrace, stating that ELF was Europe’s lingua franca’, not an imperialist tool, but a language that recognize the different nationality and different cultures, and allowing individuals to creating their own discourse norms with their own free will with a view to promoting international understanding. If European Lingua Franca or Euro-English is indeed a variety, then it should be possibility to describe and codify it, and use it for instruction. Reminding us that Jenkins called ELF is a context variety, ELF is legitimate English, like outer circle speakers, the criteria that applied to outer circle applies also to expanding circle speakers. Early ELF studies were focused the linguistic features of ELF communication, e.g. Seidlhofer’s early article about lexico-grammatical features that might appear in ELF use, paving the way for the view that ELF is all about language code. 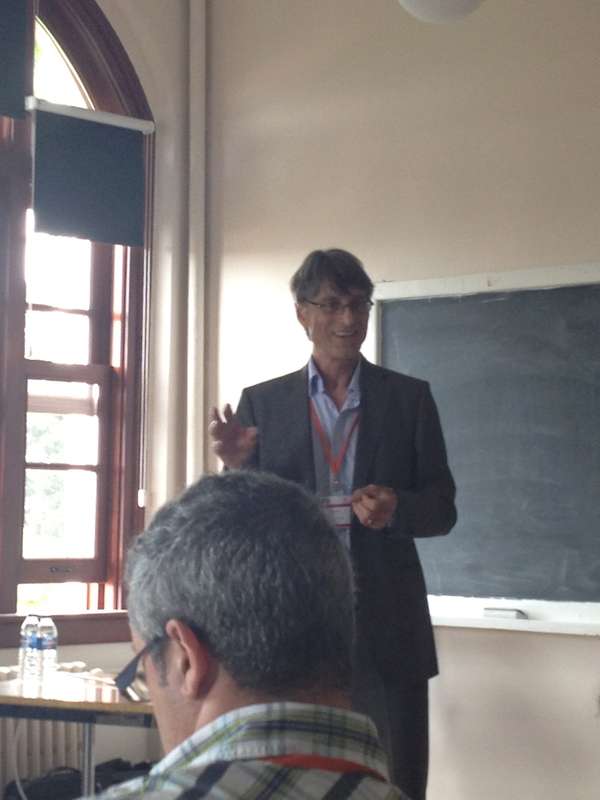 However, recent articles by Seidlhofer and other ELF proponents are more focused on the negotiation of meaning and accommodation among those in the speech community. It is time to debunk this myth. ELF is not a language variety. We can relate it to a speech community or geographic region. The construct of linguistic variety may change when speech community undergo changes. This would lead to our reconceptualization of ELF that is more usage- and context-based, one that may still show form and function patterns in its own right. Instead of a fixed structure that restricts and de-limit the forms and use, the code itself evolves, and repeated instances of language use brought about by different functional needs redefines the variety constantly. Let’s not reduce ELF to a reductionist perspective. Deficient form of English (non-monolithic/code-focused) – no linguistic variety is mono-lithic. There is no ELF community in a conventional sense. English that functions as a lingua franca (circular/function-focused) – There are millions of Elf users with different communities and using English for different purposes. But what is clear is that the form is not based on NS-norms. The emphasis is on function. Insufficient and illegitimate English (pedagogic validity?) 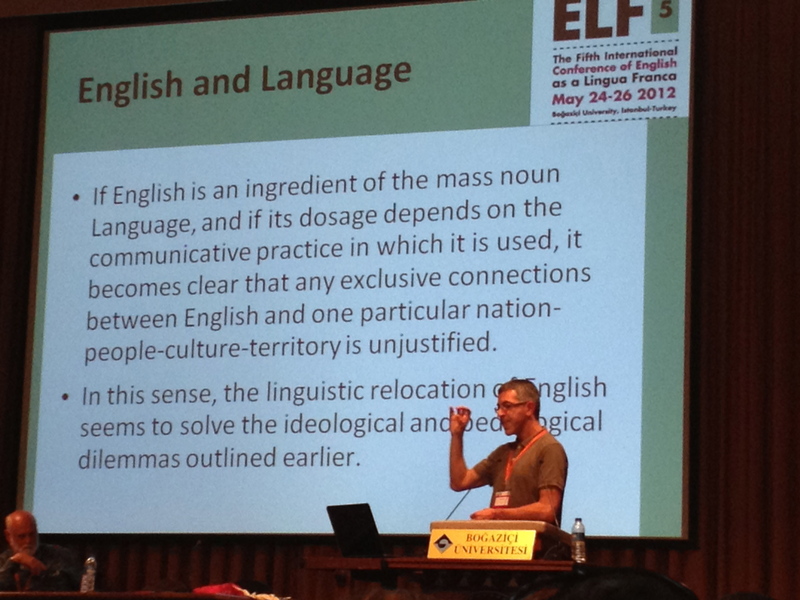 – Even ELT teachers believe that ELF is form-reductionist. But no code can exist in a function-vacuum, and no function can exist in a form-vacuum. Idioms create a sense as they are stored as a chunk in your long term memory. ELF reflects more metaphoric use than idiomaticity. Interactions between contextual demands of a globalized world and ELF users’ cognitive systems leads to new schematic and linguistic configurations. Functionalising English involves the successful use of communicative strategies across cultures (=strategic competence). They misconstrue Jenkin’s position by comparing ENL, ESL and ELF when they are completely different constructs – ENL and ESl are acquisitional constructs, whereas ELF describes the form and function mappings used when people with different L1s come together. Narrowing down ‘ESL’, they go against the tide in SLA, distinguishing acquisition and use, the L2 learner and L2 user. Parochialising ‘language variety’ – However, their calling ELF a variety is neither philosophically accurate nor useful. They subsequently define ELF as a function. There cannot be a function in language variety and no reason why ELF should be presented as such. An important talk that debunks some of the myths of what ELF is, and encourages us to see ELF as user-based, context-specific, and a fluid dynamism of functions mapped upon evolving forms. Claudia Borghetti spoke on ‘Language versus Intercultural Learning through ELF Interactions: Higher Education Students’ Perspectives’. Emphasising that NS might not know how language works, let alone how to explain the rules to others, Claudia states that if one feels less judged by their use of English, it would affect their confidence and ability to use English positively. She then goes on to outline the use of Byron’s criteria of measuring intercultural competence in terms of attitude, knowledge, skills and awareness, showing that a successful intercultural speaker is one that is able to negotiate meaning, take an external perspective of oneself and adapt. Reiko Takahashi was up next with her presentation ‘English as a Lingua Franca in a Japanese context: An analysis of ELF-Oriented Features in Teaching Materials and the Attitudes of Japanese Teachers and Learners of English to ELF-Oriented Materials’. Type of communication existing between NNSs with no NSs. Although NNS characters are found in Japanese coursebooks, no NNS varieties were found in the audio materials. In a survey, most students wanted to have more of a variety of nationalities in their coursebooks (e.g. 1 NNS, 1NS and 1 Japanese in conversation). However, Japanese teachers expressed fears about including ‘non-standard’ varieties as it might be dangerous, or not needed by high school students. Purposes of using ELF-oriented materials or introducing ELF features should thus be clearly communicated, and students should know that they are not to be imitated but are there for the purpose of awareness raising and exposure. Takahashi’s conclusion seemed to favour the use of NS-normative standards in the language used in coursebooks, while featuring a variety of characters from different countries. After a break, Valeria Franceschi gave a talk on ‘Culturally-loaded language and ELF: Idiomaticity in Cross-cultural student interaction in university settings’. These findings coincide with the VOICE corpus findings that pragmatic markers tend to cluster around the use of idioms. 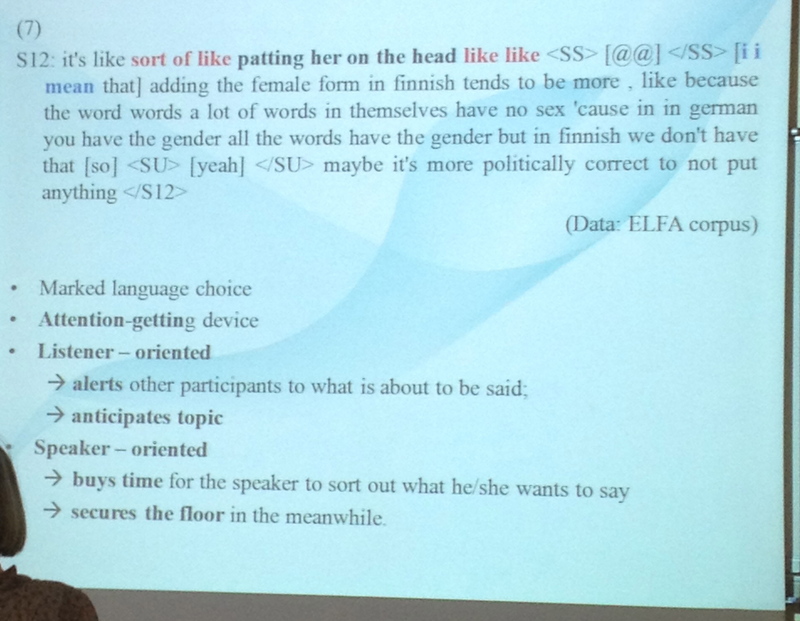 In the Q&A to Franceschi’s session, Mauranen commented that if we relax our criteria as to what we consider idioms, we would see creative language use everywhere. Marie-Luise Pitzl then questions how we draw the line between what is idiomatic and what isn’t and suggests that this line on its own could be seen as NS-normative. 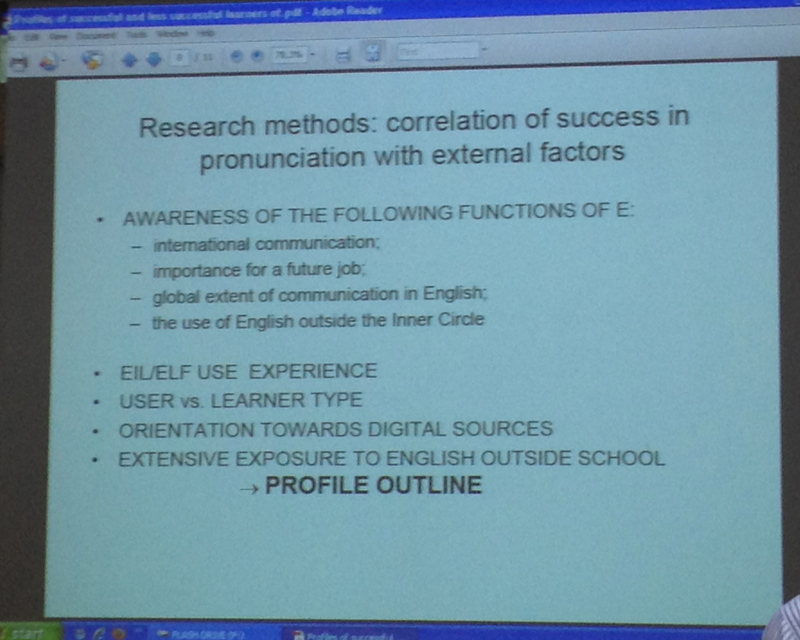 The day ended for me with Milan Stanojevic’s research findings in her talk ‘Profiles of Successful and Less Successful Learners of English Pronunciation in Croatian Primary Schools’. Have extensive exposure to external sources such as uses of Web 2.0 tools e.g. Facebook, where they can interact and produce English. Have only passive exposure to English, e.g. through songs and film. Suggesting future research possibilities that look into the question of whether a successful learner = a successful speaker, Stanojevic then goes on to ponder a question from the audience as to whether students from her monolingual Croatian class would use different pronunciation features when talking to other people who do not have the same L1, leaving the audience to think about the accommodation skills of our students when put in an intercultural scenario. Do I tweak my presentation so that I do it straight-laced? Or should I stay as the mad hyperactive Chia that the TEFL world is more used to seeing? Or is it just nerves? The elective sessions at ELF5 are grouped into blocks of 2/3 speakers, each with about 30 minutes to present their research. 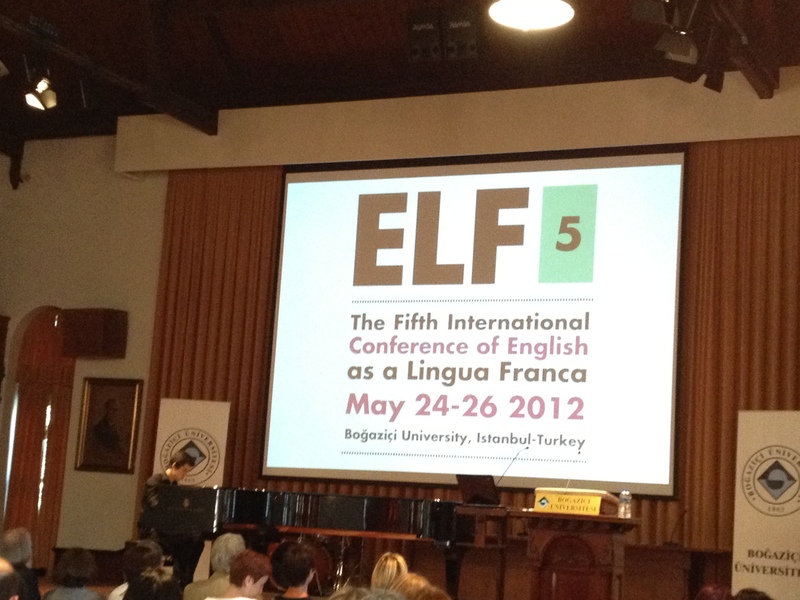 For the first elective session of the day, I chose 3 sessions on Teacher Education and ELF. 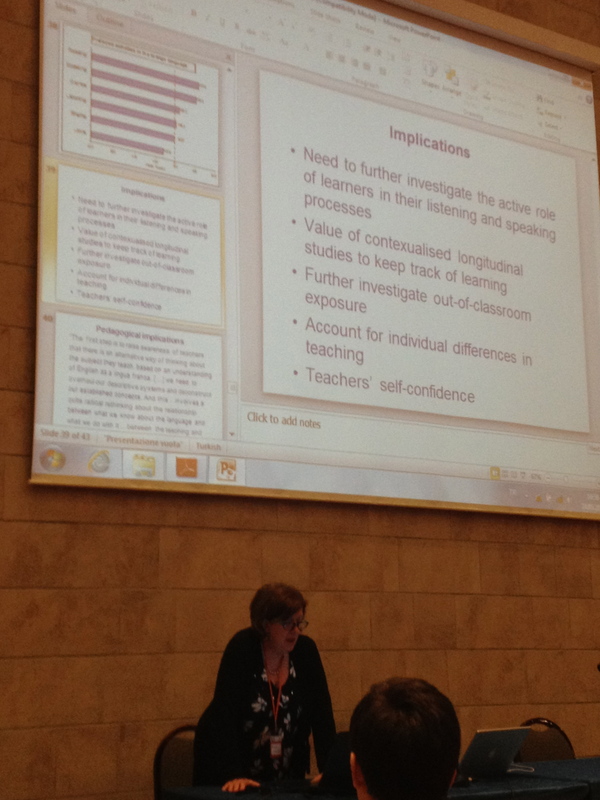 First up was Marie-Luise Pitzl’s talk – Preparing teachers for an ELF future: What we CAN tell them. Having read quite a few articles by Marie-Luise Pitzl, I found myself quite star-struck to sitting in front of her. Quoting Dewey (2007), Pitzl reminds us that we can no longer regard language norms as fixed, pre-determined, and tied to a particular geographical or cultural centre, and that teachers should adopt a different approach to ELT, reassessing the way we select materials, methods, and approaches to testing, and promoting a pluralistic approach to competence and a flexible view of language. And on the other, local contexts and local conditions. And it is thus important to raise awareness amongst teachers and teacher trainees of this sociolinguistic reality and its teaching implications. 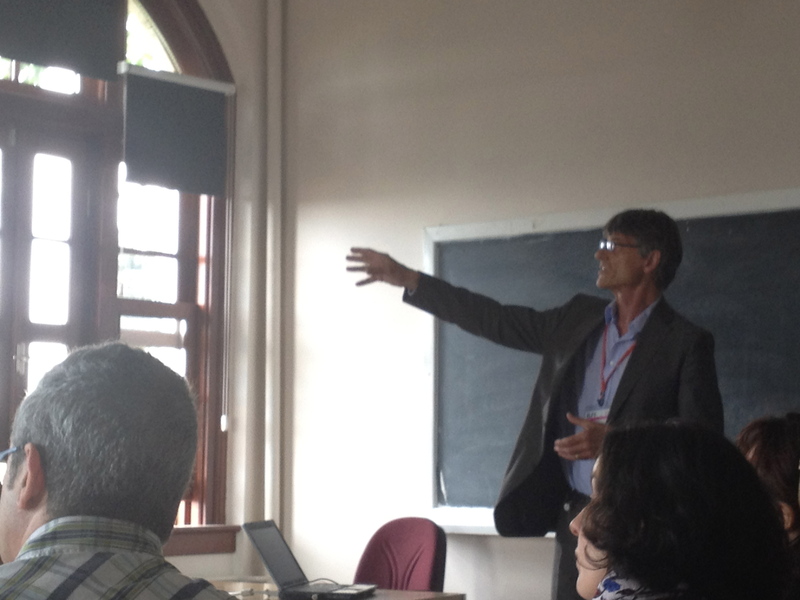 Here, Pitzl outlines the ELF component of here teacher training course. 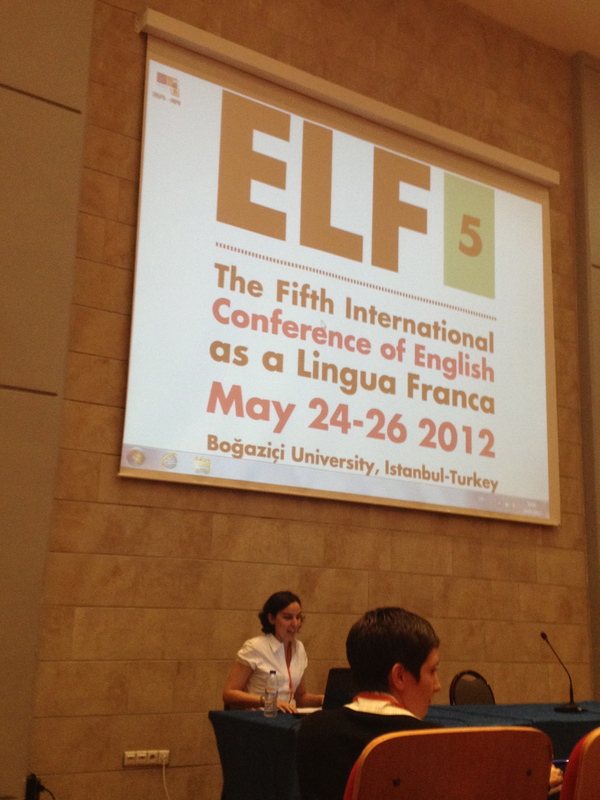 Intro some descriptive ELF findings and linking them to ELF local contexts. Giving sts the opportunity to try out diff cooperative teaching methods. 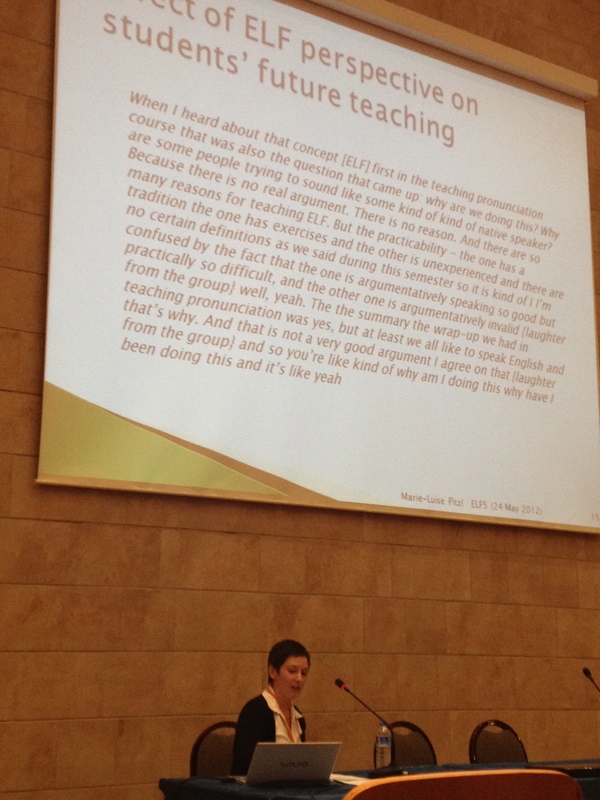 Implications for ELT – Teaching ELF? ELF, teacher identity and communities of practice. Activities used include Jigsaw activity (lexicogrammar, Interviews (teacher identity), Roleplays, etc. Next up was Lili Cavalheiro on Bringing New ELT Policies and ELF to Teaching Training Courses. Critically analyse the cultural content and reflect on one’s own culture in relation to that of others as a crucial exercise. C2 – Appreciates fully the sociolinguistics and sociocultural implications of language used by NSs and can react accordingly. She then goes on to remind us of Seidlhofer (2011) paper on CEF’s lack of differentiation between the study of modern languages and EFL and ELF. Still referencing Seidlhofer (2011), Cavalheiro then suggests that on a macro-level, teacher training courses should not only look at the nature of language and communication through language awareness, but also through communication strategies, intercultural communication, and sociolinguistics. On a micro-level, we should take our teacher trainees’ context into consideration and develop a curriculum that fits into a more general framework of communication. Last but not least, we should help trainees develop critical thinking of materials, and help them with not just what materials are being used, but how they are used. Early introduction of English to YLs mean plurilingualism. This means that classrooms will no longer be monolingual. Parents want a NS teacher because they think it means their kids would pick up the ‘right’ pronunciation. The primary classroom population in Europe is mainly multilingual and multicultural. 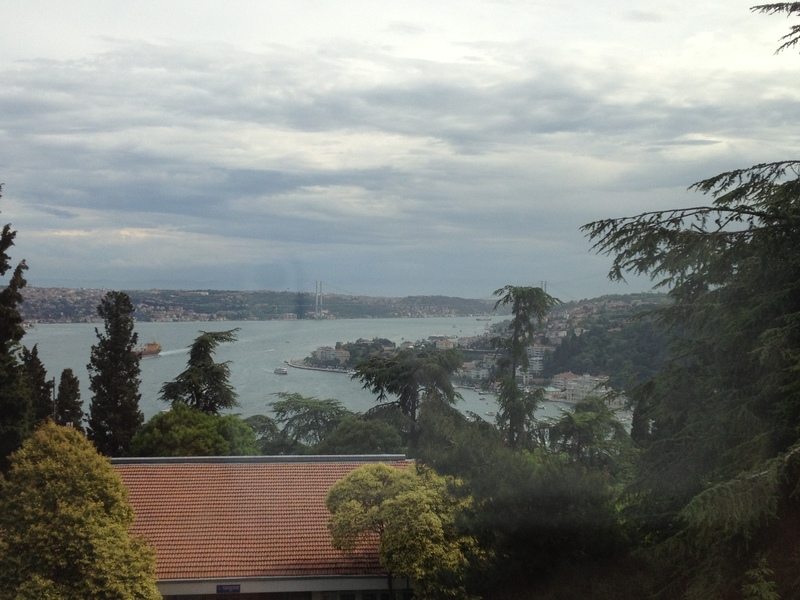 The ELF conference starts today in Istanbul, Turkey, at the gorgeous Bogazici University. After a smooth registration and a few welcoming opening speeches, Professor Tim McNamara delivers his opening plenary on Assessment and ELF. Previously, much has been written about ELF and testing. Jenkins (2006) challenged Cambridge in resisting implications of ELF. Taylor (2006) wrote about the difficulties and challenges with applying ELF to testing. Leung & Jenkins have recently stressed again the importance of recognizing ELF in language testing (in press). Critique on how criteria of language testing has acted as a roadblock has also been articulated by Seidlhofer. B2 Conversation – Can sustain relationship with NS without unintentionally amusing or irritating them or requiting them to behave other than they would with a NS. B2 Informal Discussion with Friends – Can keep up with an animated discussion between NS. Whole section on ‘Understanding conversation between NS’ in CEFR, with no description for those of A1 level (as if to say forget about it). And air traffic controller communication with pilot, either of whom may be NNS. Simultaneous communication going on between single air traffic controller and several pilots. The spontaneous creative and non-coded use of a given natural language used only when standardized phraseology cannot serve an intended transmission. Criteria : Pronunciation, structure, vocab, fluency, comprehension and interactions. – Accent, word choice, speed of NS pilots. 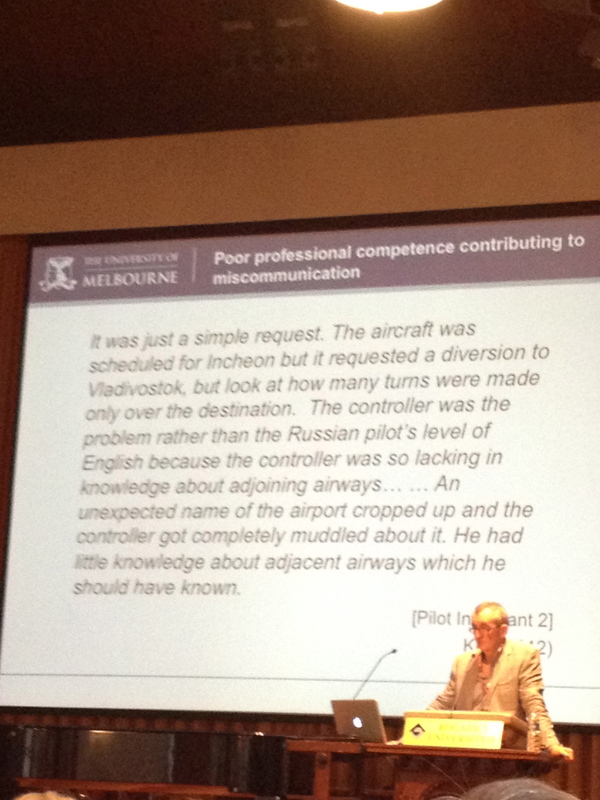 – Miscommunication often due to NS waffling, or lack of professional competence (he didn’t know about the adjacent airways). – An experienced controller is able to know what is happening with just one word. – cf Korean pilots pre for new destinations by listening to Vietnamese voices. – The more challenging the task that a person can manage, the higher their ability. – Cf high jump – ability expressed in terms of the height of the bar. – Issue of pairing –cf diving – build in ‘degree of difficulty’? – Issue of distinguishing contributions of individuals for score reporting purposes. – Problem of motivation – hospital example – assessment of moral qualities. Thinking about testing and ELF raises broader issue in language testing: performance tests. At the end of his talk, Ana Mauranen says the issue of testing NSs is a valid one, so as to ensure equal starting point. Tim McNamara answers: NS have a strong political & social advantage so do not expect them to give it up without a fight. Another audience member asks how he seems to be talking about specific purpose testing. But what about general English testing? His answer: We can apply specific purpose context to general context. e.g. emphasis on communicative competence, ability to accommodate with our language use and accents, etc.